We bundled what is left of the early pressings of Mike's first professional efforts. 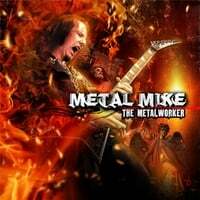 Although these records do not display high dollar studio productions, here is your chance to grab all of these CDs at a great price, and dive into unfiltered, unbending full on metal bliss of early Metal Mike.These albums will never be available in this form again, so get them while they are in stock. Limited quantities. Each order comes with an Isolation Chamber Metal Mike guitar pick. Mike's first official release. Grind Textural Abstraction is a wicked heavy instrumental album that proved to be a great stepping stone in Mike's career. Not only it gathered Mike amazing press in mags such as Guitar Player and Guitar World, this was the album that The Metal God himself heard and then further invited Mike to try out for his then new band. Limited quantities. Recommended. Mike's second mostly instrumental solo release features an album full of incredible solos and aggressive compositions. A must for die-hard guitar fans everywhere. Not for the weak hearted, The Spilling delivers an instrumental guitar armageddon of a record featuring specially reworked & remixed tracks including super rare demo material from Mike's very early recordings. All CDs come hand signed by Metal Mike.